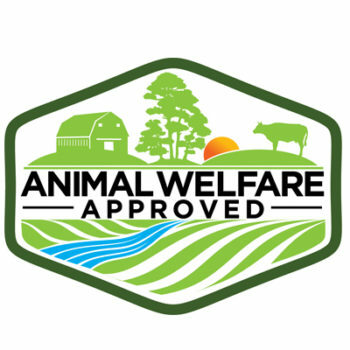 Terrebonet, OR (JANUARY 26, 2017) After months of constituent feedback, market research and design work, A Greener World (AGW)--North America’s most trusted and transparent farm certifier–has released a brand new logo for its market-leading third-party certification, Animal Welfare Approved. As part of the strategic campaign centered on the debut of the new logo, Animal Welfare Approved is re-launching its websites as animalwelfareapproved.us and animalwelfareapproved.ca to reflect the global nature of this growing brand, with animalwelfareapproved.sa coming soon with the launch of Animal Welfare Approved in South Africa. The new logo will be available in French and Spanish, with plans to translate AWA standards accordingly. Certified parties will transition to the new logo in the coming months, and A Greener World is offering a professional labeling support service to maximize the benefits of the new logo. For more information about Animal Welfare Approved–and A Greener World’s other leading third-party certifications–visit agreenerworld.org.